Nothing good comes from snowy places. I know this as a fact based on my experience trying to shoot the relay in New Zealand’s ski fields 70 days ago. But here we were again in the snow, this time at Mount Hotham in Victoria. 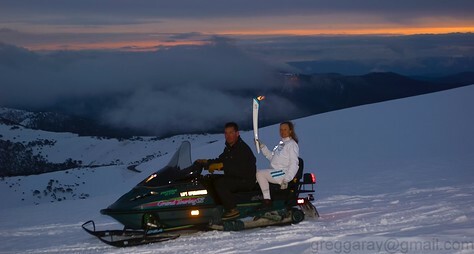 We did the snow mobile and skier thing again – but I was more grounded this time – no riding shotgun on anything. 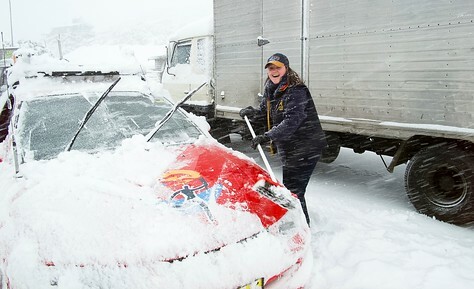 Overnight there was a huge dump of snow and we awoke with a real problem of how to dig our vehicles out fo 6 inches of snow and drive back down the mountain. 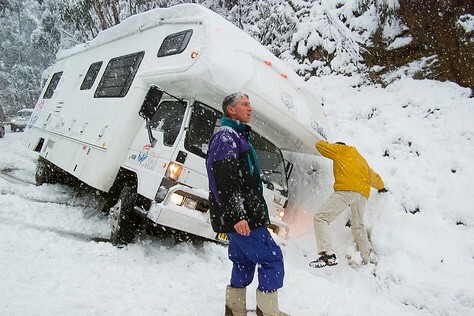 The roads were treacherous – and subsequently our media motor home slide of the road while I was in it. We ended up at a 45 degree angle. No casualties. But just another acknowledgement that nothing good ever happens in the snow.